IFDA inspires collaboration within the furnishings and design industries to support its people, their products and services. 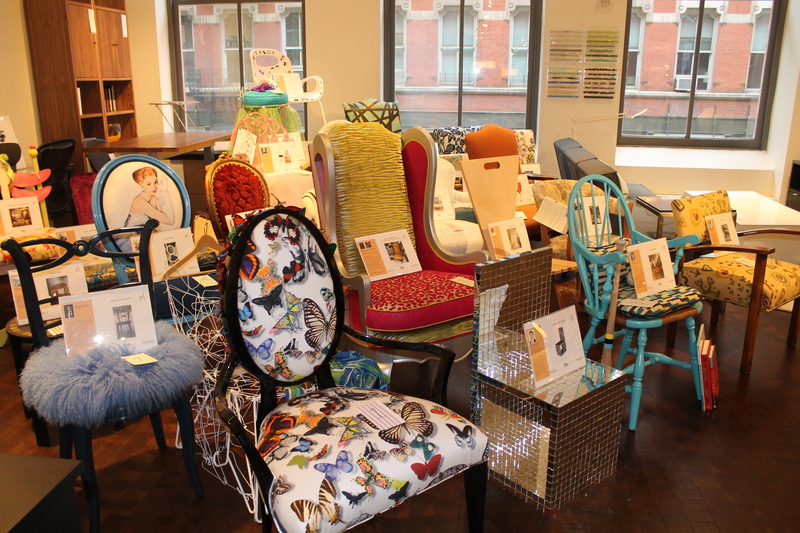 The Take A Seat Auction for Charity exhibits up-cycled and one-of-a-kind chairs from design talent around the country. Proceeds benefit local charities. This year, several local Chapters are participating during the Spring and Fall seasons. Take A Seat is an ongoing project of the International Furnishings and Design Association (IFDA). It promotes talent within the design community and fulfills our mission to service others. Proceeds from each auction will benefit local charities and continued IFDA chapter development. How Does Take A Seat Work? Chairs from the 2014 NY Take A Seat waiting to be auctioned. IFDA members, at home and abroad, work together to put on Take A Seat design exhibitions. In each community, members of the furnishings and design industry creatively re-imagine ordinary chairs, turning them into works of art. We display the chairs for your enjoyment during a free exhibition. Each chapter works with their community to select the location. At the exhibition close, we conduct an auction. The proceeds benefit local charities chosen by each chapter and support chapter professional development. The chairs are crafted locally by design professionals and students who volunteer their time and their chairs to support a local charity. This is the fifth annual IFDA Take A Seat exhibition. In its first year, 2013, IFDA chapters in New York, San Diego and Osaka, Japan conducted the first ever international simultaneous design exhibition that benefited the Japan Tsunami Relief and Hurricane Sandy Relief. Chair by Dennis Schlentz for the Southern California Take A Seat exhibition in May 2013. Take A Seat is bigger than each IFDA chapter. Check out the amazing chairs from previous exhibits. Connect with a local IFDA chapter to contribute a chair for the event. Learn how to become a Take A Seat patron and help us make the magic happen. Connect with IFDA Take A Seat on Facebook and Twitter. Tell your friends about our exciting event. Use the social share buttons at the bottom of each page to let them know. Since 2013, several local chapters have participated in IFDA Take a Seat™ creating an initiative called Helping Heroes at Home. Chapters pledge 70% of the net proceeds from these events to a variety of local charities. Check the Chapter near you for their charity of choice. Through the generosity of event Patrons, IFDA chapters will be able to contribute to important local causes. We rely on the generous support of our national patrons to fulfill our goal. Please support this event to help fund the IFDA initiative called Helping Heroes at Home! Each participating Chapter is in need of local Patrons for Take A Seat exhibitions. Support a great local Charity and show members in your community how important you take your civic duty by giving back. You’ll get great exposure and spreading good will at the same time! To learn more, see our patron page.